Kim's Krafty Corner of the World! : Finished Newspaper!!! Kim's Krafty Corner of the World! This blog is about crafting, cooking and my life as a mom. I started this quilt sometime in 2012. Then, In 2013 I was so into papercrafting that I did no quilting. But I decided that this is the year to finish up some UFO's from 2012. This is the first finish! I made the middle portion by doing the jelly roll race pattern technique, except that I did not have a jelly roll. I used various fat quarters and some yardage that I collected and then cut them cut them in 2.5 inch strips, with differing lengths and then went from there. 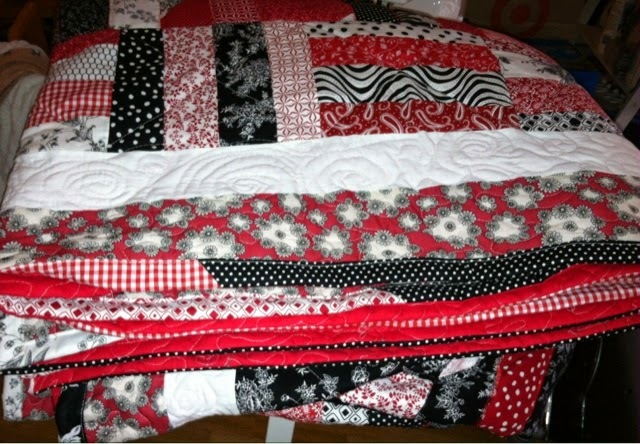 Since this ends up as a lap size quilt I bordered it with rail fence blocks because I wanted a queen sized quilt. I them bordered that with a white on white print and finished it off with floral print in black, white and red. I backed it with flannel because I just love the feel of it against my skin. 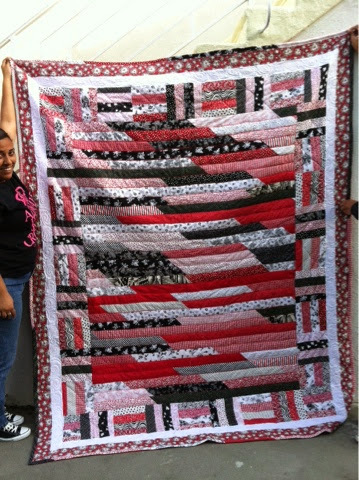 This quilt is huge but I quilted it myself on a tiny little machine. I am a novice so my quilting/piecing will not win any prizes anytime soon but I just love it! I had so much fabric left over so I just decided to go with a scrappy binding. I like how it turned out as well. I am on a roll! I already began quilting my next UFO so hopefully I will have another finish soon. Its not as big as this one but its not small either. Looking forward to more 2014 finishes! Knitting and Crocheting in LA for the past 3 years. Its my therapy.